Okay, I know what you’re thinking – two crisps posts in one day? We promise we hadn’t eaten them all on the same day but let’s be honest, we probably could have. If you’ve been following us for a while now, you’d know in every tag question and in life tweets – I, Jessica, am completely obsessed with all things potato! I even call James a potato, in the nicest way possible of course, but it’s because I just love them! But the potato I love by far the most, is crisps. I could honestly eat 36 packets in one sitting without hesitation YEAH *fist pumps*, so when James sent me a link to this new restaurant, how could I say no? Okay to the main point, on arrival we were amazed at how open glassed it was, you could see all the chips and dips out on display and just made it even more exciting to choose from. 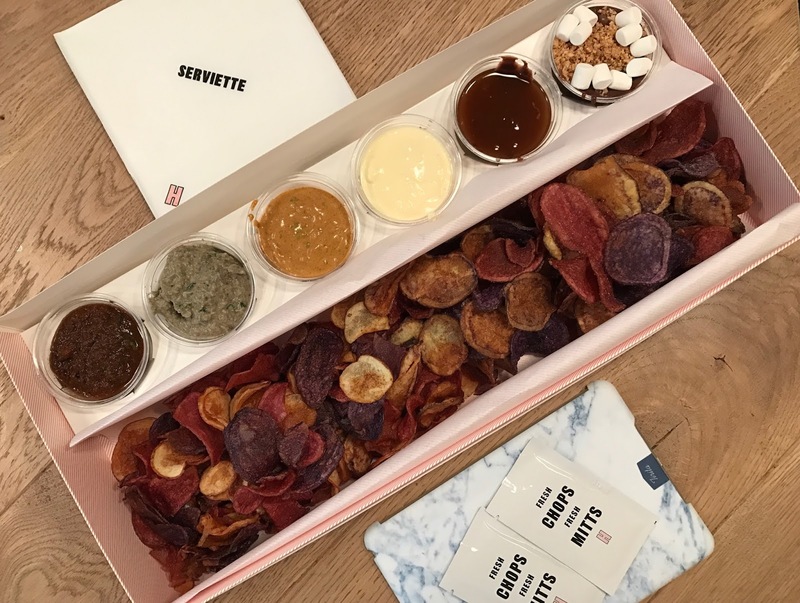 Of course we went for the largest box with six dips, and had a mix of both savoury and sweet chips and dips for £11.50 – we just wanted to try it all! Overall it was a great experience and if you’re a potato lover like me, I’d seriously recommend it! This sounds different; I'm not entirely sure how I feel about it but it sounds like it would be great for a snack whilst you're shopping. Oh my goodness how weird is this!? I just saw a promo video for this place the other day and felt like I needed to go and now here we are reading this!! LOVE IT! Really not sure on the savoury dips actually but I would try!! This sounds really weird but it sounds like it could work! I love that you have such a variety of dips!